MOCAP Sealing Plugs for BSP Threads are designed to protect British Standard Pipe Fittings from moisture, dust and damage during production, shipping and storage. Five complete threads plus a sealing lip provide a tight fit and secure seal. Can be applied and removed by hand, with a socket wrench, screwdriver or power tool. Sized to fit BSP Threads from 1/4 thru 2. These Sealing Plugs are also available with a factory-fit Neoprene Rubber O-Ring when a perfect seal is required. 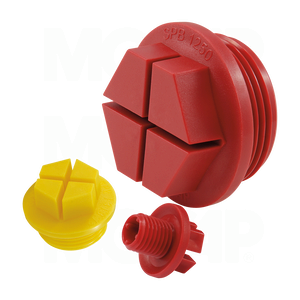 MOCAP stocks Sealing Plugs for BSP Threads in both Red Polypropylene and Yellow Nylon materials in many sizes for immediate shipment.